The Factory Theatre was on fire tonight, and not only because the weather finally hit the height it’s meant to in early July. It was on fire because the packed house of The Musical of Musicals: The Musical (say that ten times fast) was alight with intense glee (not a pun, I swear) at the incredible show they just witnessed. I think the sign of a really excellent show is when you’re already thinking about all of the people you absolutely have to recommend it to even before it’s one-third over. There are a good chunk of people I know who must see this show, all of them are musical theatre lovers, but I think even those who are mildly tickled by the art of using singing and dancing to tell a story would enjoy it. 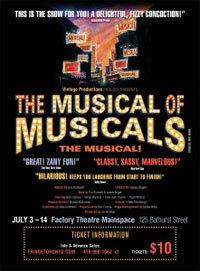 The premise is simple; a story told in five different ways, reflecting five different musical theatre styles. The story is that of a young woman who can’t pay her rent (a nod to Jonathan Larson, perhaps?). It seems a bit daunting to think that you see this plot unfold in five different incarnations, but the delivery makes it completely worth it. Not only is the script smart, punny, witty and pitch perfect, the music is uncannily referential to some of the greats in musical theatre. The specific composers parodied range from Rodgers and Hammerstein, Stephen Sondheim and Jerry Herman to Andrew Lloyd Webber and Kander and Ebb. There are some great references to Fosse as well, thanks to brilliant choreography from Consensus and Theft. In all honesty though, it’s the cast that make this thing such a powerhouse. Dana Jean Phoenix is both darling and derelict as the ingénue June, and can that girl sing and dance at the same time or what! Adrian Marchuk makes an eloquent transition from down home farm boy to tortured lyricist to flamboyant jail bird, and the added bonus of some soft shoeing is the icing on the cake. Mark Cassius, Broadway vet, is subtle, smooth, oily and charming the whole way through and swivels his hips a la Fosse like nobody’s business. Lastly, Paula Wolfson belts the f— out of everything and shakes the house down at every turn. It’s clear this show is an exceptionally polished piece that, even with its non-existent set, paints a perfect picture of all we love –and laugh at- about musical theatre. I’m almost disappointed that this was only my second show on the first day of the festival, as anything else I see will have a really hard time living up to this quality. I foresee tickets for this selling out incredibly fast. The Factory balcony is open for this performance, so at least there’s that. If you’re still reading this far, you should shell out your $10 right now for a ticket to The Musical of Musicals: The Musical. You won’t be sorry. I promise. Individual Fringe tickets are available at the door for $10 ($5 for FringeKids), cash only. Late comers will not be permitted. Advance tickets are $11 ($9 + $2 service charge) are available online at fringetoronto.com, by phone at 416-966-1062 ext 1, or in person during the festival at the Festival Box Office in the parking lot behind Honest Ed’s (581 Bloor St W).